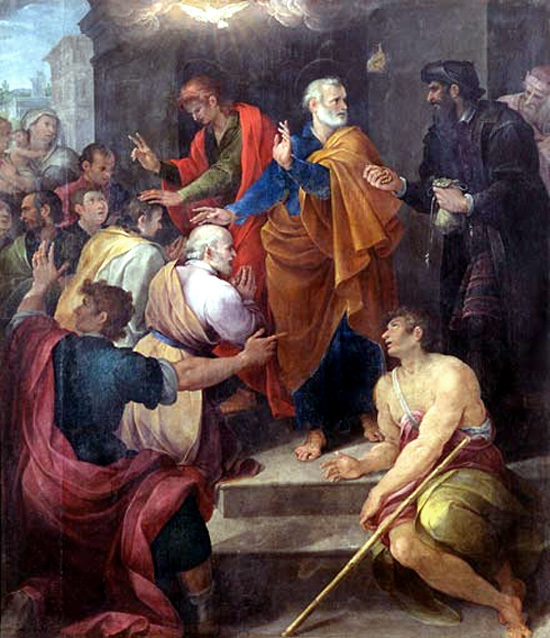 Peter’s conflict with Simon Magus by Avanzino Nucci, 1620. Our world is filled with deception. Often it is easy to spot and sometimes it is not. Experience of course helps to sift the wheat from the chaff. Spiritual deception is especially evil in my opinion because eternal souls are at stake. That is why I personally detest most of what I see on Christian TV these days; spiritual charlatans come a dime a dozen it seems, and they have the power of media to deceive many young Christians and others. The proof is that they teach many unbiblical doctrines and use the power of religion to milk money from undiscerning people who are probably the least able to afford it. In turn they rob gullible Christians and the local church. Another area of religious deception comes from those who promote so-called miracles and signs and wonders. I believe in the charismata, e.g., the gifts of the Holy Spirit as outlined in the New Testament. I have seen real miracles happen through prayer. But most of what passes for “revival” and “miracles” these days is embarrassing, and completely foreign to biblical truth. It is more akin to enchanting, or fetish magic. I know a man who is very ill, and he went to a group of Christians for prayer; he was hoping for healing and at least some relief from his illness. When he arrived at the prayer meeting he was told all about the results they have been getting: for example, gold teeth, which suddenly appeared in the mouths of the faithful. He was told all about the gold dust, and the sudden appearance of angel feathers and anointing oil. He was told all about the glory cloud and visions. He went through the motions but left totally discouraged, because like me, he realizes the spiritual games that people play–and he didn’t appreciate being the target of the game. He wanted real hope from the Living Lord of the universe and all he got was a spiritual counterfeit, a fabricated litany of lies and games–all in the name of Jesus. If Christians have trouble spotting spiritual deception now how are they going to discern truth from error once the Fallen Ones are here on Earth in the flesh for all to see? There is coming a time when the Devil and his angels will be cast permanently from the heavens to Earth (Revelation 12:7-9). Currently they reside in the atmospheric regions around Earth, that is why Satan, the chief Archon, is called the Prince of the Power of the Air (Ephesians 2:2). Rev 12:12: Therefore rejoice, ye heavens, and ye that dwell in them. Woe to the inhabiters of the earth and of the sea! for the devil is come down unto you, having great wrath, because he knoweth that he hath but a short time. If people are unable to discern spiritual deception now how are they going to discern truth from error once the Fallen Ones suddenly come to Earth in Chariots of Fire? Will discernment even exist after the Fallen Ones are here? Perhaps that is why Jesus said “when the Son of man cometh, shall he find faith on the earth” (Luke 18:18)? That is a serious question we should all ponder, if we believe biblical truth and the prophetic word that is. Because the truth of the matter is that many Christians are woefully unprepared for what is coming. Many never really give serious thought or consideration to the dire implications of biblical prophecy, and how it will personally affect them. Have you? Ezekiel 39:6: And I will send a fire on Magog, and among them that dwell carelessly in the isles: and they shall know that I am the LORD. Have you thought about the fact that the isles may refer to distant countries like the United States, Great Britain, and Australia? Countries now that are relatively safe from invasion (other than random terrorist attacks). Once the Middle East is on fire it is possible that that event may be the moment when the Fallen Ones are expelled from the heavens. Millions may believe that Satan is Christ, and millions of fallen angels are the Hosts of Heaven. They may appear as incredible beings of light. The deception will be perfect, and the timing will be splendid. Billions of people may believe that UFOs and aliens have come to rescue the world from self-destruction. I dare say that the majority of the Christians living in the U.S. and other prosperous places are too occupied right now trying to get their “blessing.” They are too busy running from prophet to prophet searching for a word that will satisfy their already over sated spiritual souls–while they neglect the most important things–the Prophetic Words found in the Bible, and private prayer and devotion to the Lord. Is it because they are safe in the belief that they will be “raptured out of here” before all hell breaks loose on Earth? Perhaps we should read the prophetic Word again because in the Revelation I see Christian martyrs all over the place. That should spur all of us on to holiness and prayer before the Lord. Perhaps we have neglected our fear of the Lord. How shall we escape, if we neglect so great salvation? (Hebrews 2:3). How shall we escape if we do not take heed in fear and trembling before the Lord in prayer and repentance? The only protection from the deception is a vibrant relationship with the Living Lord of the Universe–Jesus Christ. Have faith in God, trust Him in all things, and read His Word for understanding and direction. Another spot on word for the hour.